The St. Louis Blues selected forward Dominik Bokk with the No. 25 overall selection in the NHL Draft. 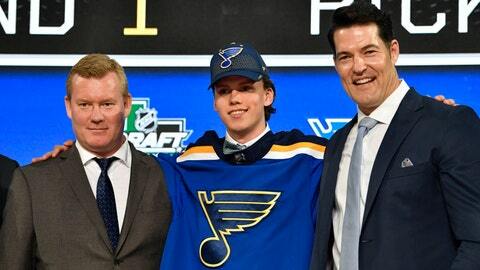 The St. Louis Blues might not have made the big deal some fans expected them to on Friday, but they were still active on the trade market during the first night of the NHL Draft. The Blues moved up to pick No. 25 in a trade with the Maple Leafs, sending the No. 29 and No. 76 selections to Toronto. They then selected Dominik Bokk, an 18-year-old forward from Schweinfurt, Germany. Bokk played professionally in Sweden during the 2017-18 season, tallying a goal and an assist in 15 games for the Vaxjo Lakers of the SHL while collecting 41 points (14 goals and 27 assists) in 35 games with the Vaxjo Jr. under-20 team. He joins an impressive collection of Blues forward prospects that also includes Tage Thompson, Robert Thomas, Jordan Kyrou, Klim Kostin and Erik Foley.